RICHMOND, Va. – The Richmond Kickers welcome Swansea City AFC of the Premier League for an international exhibition presented by Virginia Credit Union at City Stadium this Wednesday night at 7:30 p.m. ET. Wednesday’s game marks the second meeting between the Kickers and the Swans, and the fourth consecutive season Richmond will host a team from the Premier League. Richmond came out on top with a 2-0 victory when the teams met for the first time on July 16, 2016 in front of a then-record crowd of 7,128 fans at City Stadium as an own goal and a tally from Anthony Grant earned the club its first win against Premier League opposition. In last year’s meeting, the Kickers took the lead in the 11th minute when former Kickers player Brian Ownby sent a cross in for Sunny Jane just in front of goal. Jordi Amat stepped in to try to clear, but ended up directing the ball into his own net. Following a delay due to storms in the area, the Kickers netted their second goal of the game as Grant slotted home after Jackson Eskay placed a through ball into his path. The Kickers come into this friendly after falling on the road to the Harrisburg City Islanders on Saturday night. Harrisburg scored the only goal of the game in the 76th minute as James Thomas played a quick pass to Ropapa Mensah. He cut across the top of the Richmond box and took a shot towards the far post and past Matt Turner. Swansea is looking for its first win of preseason, as the Swans have lost one and drawn so far this preseason. 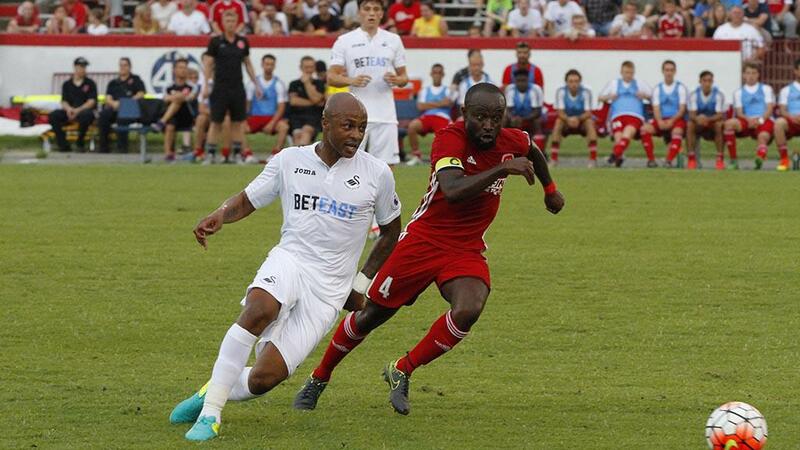 Swansea opened their preseason on the road at League Two side Barnet July 12. A 40th minute goal lifted Barnet over the Premier League side as Swansea prepared for their trip to the United States. Opening up their three-match tour of the U.S., Swansea earned a 2-2 draw at the Philadelphia Union this past Saturday at Talen Energy Stadium. Leroy Fer headed a deflected shot back towards goal and Kyle Bartley found the back of the net to equalize in the 28th minute, after C.J. Sapong converted from the penalty spot in the sixth minute to give the hosts an early lead. Swansea took the lead in the 40th minute as Brantley set up a chance for Jordan Ayew from 10 yards out. The Union leveled the score through Jay Simpson in the 58th minute as honors ended even. Festivities at City Stadium begin at 5:30 p.m. with live music from the Hit List, RVA food trucks and more than 20 craft beers on tap before the Kickers battle the world’s best.